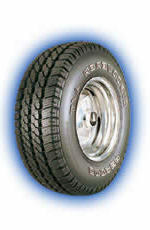 Allows the tire to perform equally well on the road and off. Computer-formatted SNDQL (Sound Quality) tread design optimizes the tread pattern\'s pitch sequence for a quiet ride. Available in outlined white letter and outlined black letter sidewall designs.